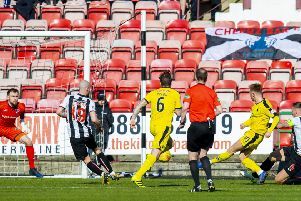 Dunfermline Athletic in action against Falkirk earlier in the season. Picture Michael Gillen. Dunfermline Athletic opted for a name change ahead of their Saturday evening clash with Hibernian following a gaffe from BBC. The Pars’ Twitter account altered their name on their social media channel to Dunfermline United after BBC Scotland advertised their game with Hibs, to be shown on BBC Alba at 5.15pm, with the new suffix. Spotting an opportunity to poke fun at the broadcaster’s mix-up they were quick to replace Athletic with United. Before showing their mischievousness, tweeting “We can be flexible though!” on the name change. It is now back to Athletic with the Fife outfit heading to the capital as they attempt to stay clear of the relegation play-off spot.